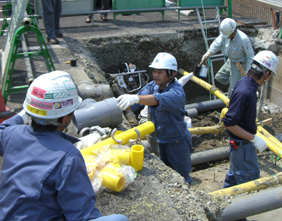 Gas Pipe Arrangement - Kyuhai Tech Co., Ltd.
We provide high quality services with advanced techniques dedicated to customer satisfaction. 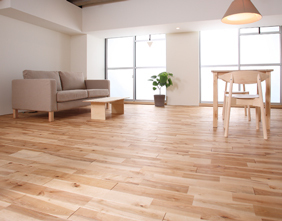 We conduct construction and installation mainly in Fukuoka City, Munakata City, Tosu City, Kurume City, Itoshima City, and their surrounding areas. We conduct our work with particular attention to safety and security. Please do not hesitate to consult with us regarding the work in uncovered areas. We deliver the highest standards of skills with the latest techniques in installing machines, including Warm Water Heating and Cooling System, Warm Water Floor Heating System, Bathroom Heating Dryer, etc. We proudly installed “Ene Farms” in 50 houses out of 150 households in “Fukuoka Hydrogen Town” in Itoshima City. It is a part of Hy-Life Statistic Project, the first project in the world, conducted by the Fukuoka Prefecture. In the project, “Ene Farm”, (household fuel cell) was installed throughout Itoshima city. We achieve and sustain superior performance in installing and selling “Electric Power Generation.